Agile sprint planning, iterations and code reviews. Airtouch follows Agile, a software development method used today to develop websites, web and mobile applications and focuses on delivering high-quality working software efficiently and consistently, while minimizing project overhead. With our Agile software development approach, we ensure your next software development project will be managed effectively and the result will be high quality. It’s important to understand a client’s vision and background when starting any new project. Agile software development projects start with a series of Discovery Sessions and research to understand a client’s goals, challenges, business climate, and customers and users. These sessions include key members of the project team including the client, project manager, designer, developer, and product owner to ensure a shared understanding across the entire team. During Discovery, the team works together to create a high-level Product Backlog, a wish list of all the features that would be useful to the client and their users. The product owner works with the client to prioritize these features, determining the order in which the features are elaborated, developed, tested, and delivered. By allowing the client to determine priority, the team stays focused on delivering the highest value features before moving on to lower value features. After ensuring the team understands the client’s vision and has created a high level backlog of features, the team delivers features through a series of time-boxed iterations called Sprints. These are fixed durations of 1-4 weeks (depending on the project size and duration),each delivering a subset of the overall product backlog. Additional Sprints are conducted as needed to deliver additional features and incorporate feedback from previous iterations, reviews, and user beta testing. Each successive Sprint is both Iterative, providing improvements to work completed in previous sprints; and incremental, adding new features to the system. By incorporating Agile methodologies into the software development process, Airtouch can have a big impact on the overall success of the project. Feedback and modifications take place quickly to identify and correct small problems before they become big and costly to fix. Communication throughout the process is also enhanced by Agile project management. 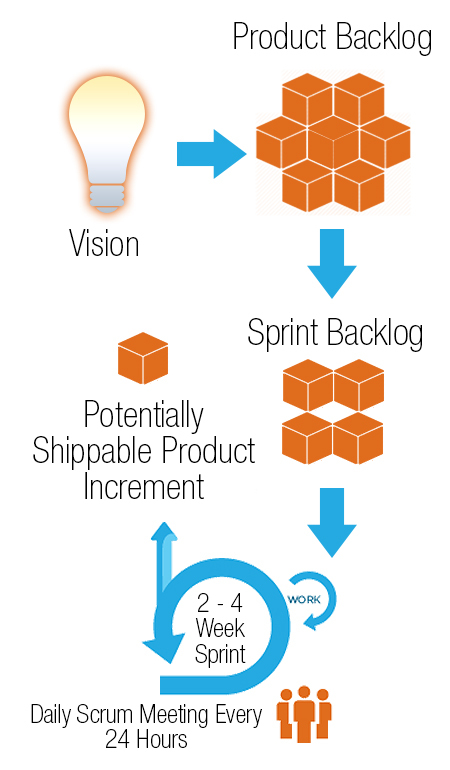 Overall, Agile provides Airtouch with a lean and effective model for the successful development of software.